Charing Cross railway station, also known as London Charing Cross, (sometimes informally abbreviated as Charing X) is a central London railway terminus in the City of Westminster, England. It is one of 19 stations managed by Network Rail and all regular trains serving it are operated by Southeastern. It is the fifth busiest rail terminal in London. 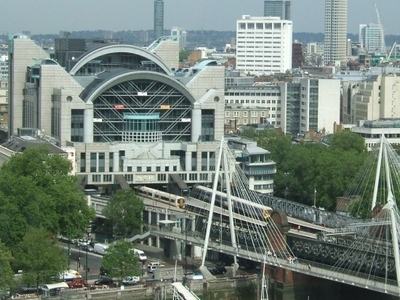 The office and shopping complex above the station is formally known as Embankment Place. The station takes its name from its location next to the central London Road junction of Charing Cross. The front of the station faces the Strand, while at the other end is the northern end of Hungerford Bridge, which is crossed by all trains serving the station. Ticket barriers control access to all platforms, although the bridge entrance has no barriers and is only open to passengers during the morning peak hours. 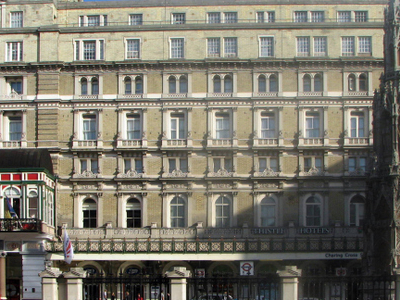 Charing Cross is the London terminus of the South Eastern Main Line. All regular services are operated by Southeastern which provides the majority of commuter/regional services to South East London and Kent. The original station building was built on the site of the Hungerford Market by the South Eastern Railway and opened on 11 January 1864. Here's the our members favorite photos of "Railway Stations near City of Westminster". 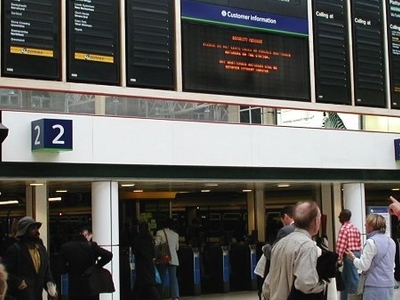 Upload your photo of Charing Cross Railway Station!